Joannes Nolet founded his distillery in Schiedam, Holland, in 1691. He most likely made jenever, a distillation of malt wine that is widely regarded as the precursor to gin. Back then, the spirit was produced in a pot still, which was the only distillation vessel available; since the pot still yielded a range of impurities, herbs and spices were added to cover them up. One of the additions was the juniper berry, and gin as we know it now was launched on its evolutionary trajectory. Today the company is run by Carolus Nolet and his two sons, representing the 10th and 11th generations respectively. You may not be familiar with Nolet's Gin, but you’ve likely heard of their other spirit: Ketel One. Carolus introduced the vodka into the U.S. in 1983, and the brand now has sales of two million cases annually. 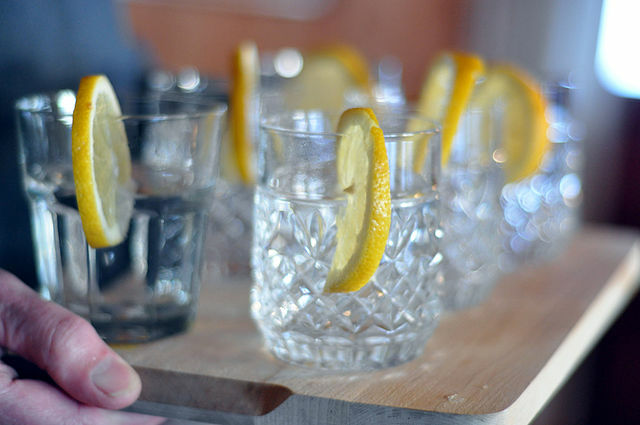 Jenever may have morphed into gin during the intervening three centuries since the founding of the Nolet distillery, but the clan is still making it---the spirit remains incredibly popular in the Netherlands, with a market share of 25%. There are two major styles, Jonge (young) and Oude (old) jenever. The differences between the two have nothing to do with aging, although old jenever may well see a few years of maturation in barrel. Young jenever usually contains more grain than malt, and is a nearly neutral spirit (similar to vodka) made by cutting-edge distillation techniques. Old jenever, by law, must contain at least 15% malt wine; it is generally made in pot stills, and has a rich, earthy flavor akin to whiskey. The Nolet family makes both. With the arrival of the 11th generation, Carl Jr. and Bob, the Nolet company began the transition into the 21st century (while there’s no admitted connection between the two events, one gets the sense that they may well be cause and effect). The family decided to make a modern style of gin that would still reflect their heritage and roots. The result was Nolet's Silver Dry Gin ($50, bottled at 47/6% ABV/95.2 proof), marketed as “The New Face of Gin” and aimed at the generation that came of age during the recent explosion in America’s cocktail culture. In addition to the standard botanical (juniper, orris root, citrus, etc. ), Nolet's Silver uses three never employed before in the production of gin---peach, raspberry and Turkish rose. Nolet's Silver Dry Gin has a lyrical, floral nose highlighted by scents of lemon zest. It is seamless and graceful in the mouth, offering an assortment of intertwining flavors in the mid palate: licorice, mint, white pepper and citrus. The texture is lush and rich, the finish is long and gentle, and the gin is a pleasure to drink---in addition to being eminently mixable (see below). That’s as far as it goes for most of us, but Nolet's also makes a Reserve Dry Gin. With a hefty price tag of $700 and a ridiculously small production (only 498 bottles were released in 2010), this gin is the personal creation of Carolus Nolet Sr. It’s made in small copper pot stills and highlighted by flavors of saffron and verbena. With the reported color of a pale yellow diamond and an alcohol level of 52.3%/104.6 proof, it claims to be “the world’s first limited edition sipping gin.” You can experience it if you have silly amounts of disposable income and a well-connected retailer, or you may order it at venues such as the Beverly Hills Hotel, the Plaza or Waldorf in Manhattan, and The Breakers in Palm Beach. Stir first four ingredients with ice in a cocktail shaker. Pour into an ice-filled highball glass. Top with soda water, and garnish with a wedge of lemon. Stir ingredients with ice in a cocktail shaker and pour into a Collins glass. Garnish with a twist of lemon. Pour first three ingredients into an ice-filled rocks glass. Stir well. Top with a light drizzle of cassis liqueur. Garnish with a raspberry.